The Blue Ridge Rounders of Upstate of South Carolina have been playing together since 2002. Their live music and CDs reflect the history, values and lifestyle that were so dominant in days gone by. With an edge from bluegrass and a deep respect for the musical traditions of the mountains, the Rounders play a hard driving, fun loving music with the depth of an ancient knowledge. They are the 2006 and 2007 Mountain Music Champions and winners at the 2006 North Carolina State Fair Old Time band contest. The band plays throughout the region ranging from Virginia, the Carolinas, Tennessee and Georgia, even playing as far north as Pennsylvania. They are featured at festivals and concerts through the summer months and also teach at workshops and week long music camps like Blue Ridge Music Week at Mars Hill College. 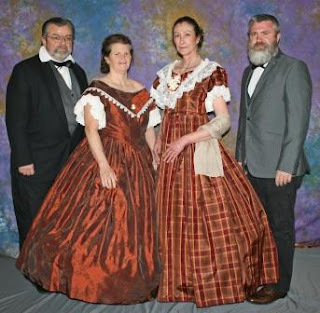 In the past few years, the Rounders have added Civil War music to their extensive repertoire, playing at a variety of Civil War balls. Their lively beats and authentic sound make an excellent accompaniment for Civil War dances. The Olde South Ball Committee is highly pleased to announced their presence, once again, at the 2019 Olde South Ball!